Whyte Avenue has been celebrated for its unique heritage, character and image, and represents a key area where growth needs to be managed and positive change leveraged to sustain Whyte Avenue’s long-term success. The planWhyte Land Use Study proposes a series of recommendations to strengthen the heritage and character of the area, manage future growth to benefit community and local business, and revitalize the heart of Old Strathcona as one of Edmonton’s premier arts, culture and tourism destinations. The recommendations are based on 3 phases of public engagement, technical assessment and support for a new development concept. The planWhyte Study is scheduled for Urban Planning Committee Tuesday August 28, 2018. Additional information is available and was posted as part of the Urban Planning Committee Agenda on August 23. The City of Edmonton is grateful for all the business owners and community members that have contributed throughout the 3 phases of engagement that included open houses, workshops, surveys and pop-ups since June 2016. The final study reflects what was shared during the final phase of public engagement from December 2017 to January 2018. Since then Administration has worked to incorporate remaining pubic feedback, present to Edmonton Design Committee, finalize the study and prepare for Council’s review at Urban Planning Committee. The study balances the need for redevelopment and enhancement with what was heard from the public, community and stakeholders to preserve local heritage, manage height, encourage active modes of transportation and support residents, businesses and visitors over the long-term. As a result, we are confident Whyte Avenue will continue to remain an important main street for your community and destination in Edmonton celebrated for its unique heritage, character and image for years to come. Whyte Avenue is a key area where change needs to be carefully managed and leveraged to sustain its future prosperity, attractiveness and livability. The City initiated the planWhyte - Whyte Avenue Commercial Area Land Use Study in 2016 following the proposal of 2 large-scale redevelopment projects (The Mezzo and Southpark on Whyte) and in recognition of ongoing development pressure, sensitivity of the area’s existing heritage and character, and assessment of the Strathcona Area Redevelopment Plan. 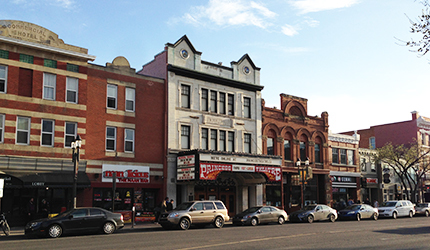 Find out more about the land use study for Whyte Avenue commercial area. Help us spark discussion and bring forward your ideas, concerns and expectations.